Like Valentine's day, Mother's day and even Christmas. And every local pub and bar will also provide an opportunity for you to hold an ongoing fundraiser. And of course the main thing is that it can be very profitable and rewarding! You will simply raise funds through the sales of flowers. Where and how you sell those flowers will depend on your cause and it's location. By having a decent profit margin – How much you sell your flowers for, minus how much you bought them for. And secondly by selling as many as possible – Increase your sales by using a good sales pitch and by advertising your flowers properly. The first thing you will need with any flower fundraiser, is to find a good flower supplier. Set up a contract with a florist or grocery store that will supply you with flowers and roses at a discounted price! You MUST shop around and find the best deal… The cheaper you can get your flowers for, the bigger your profit margin will be. And remember that bulk orders will always receive greater discounts! The next thing will be to decide on how much you will sell you flowers for. Make sure you have a decent profit margin but don't be too expensive. If you are too expensive people won't buy. But always make sure you advertise your fundraisers through your website, newsletters, and social media platforms! This will be a nice fundraiser to have as you can run it all year long! You won't need to do much advertising with this but you will need volunteers and helpers to form a sales team! What you will do is organize with local pubs and restaurants to have your sales team sell flowers to their customers on certain nights of the week. Each member will be assigned a pub/restaurant (or a few) to go through selling flowers. You should come up with good sales pitch that uses the words 'Help' and 'Because'. Your sales team should then learn and rehearse the pitch to a point where it comes naturally off their tongues! Check out the sales pitch section of the "running food fundraisers" page to find out more info about pitches. It might just save you a whole lot of work and effort that you could focus elsewhere. But just make sure that it is viable. Most people buy flowers and roses for loved-ones on Valentine's Day. This gives you a great chance to run a really profitable flower fundraiser! You should take orders for single roses, bunches and bouquets in advance. Then have the buyers pick them up on Valentine's Day or you could even offer a delivery service as an extra fundraising idea. Try ordering your roses in Bulk as you should receive a bigger discount from your supplying florist for bigger orders! This flower fundraising idea will work really well at high schools where teen love is abounding! It will also work well with younger school kids as many of them will want to send flowers to their parents. Advertise this fundraiser through your website, social media, newsletters, as well as with fliers, posters, and direct sales! 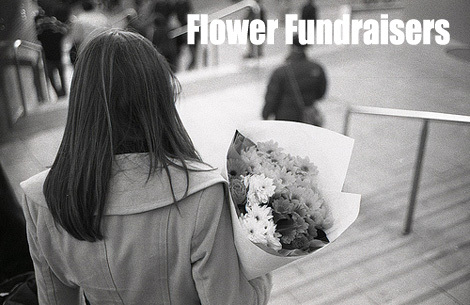 For more ideas on promoting to use with your Flower Fundraisers read here. So you should definitely tap into this great opportunity!!! You can also fundraise with Christmas wreaths at the same time! Once again take orders in advance, say during November, and then deliver them or have them picked up a couple of weeks before Christmas. Once again here is a great public holiday to run a flower fundraiser on! Children and even husbands will all be wanting to get their mothers and wives flowers! Like the above two, take orders in advance and market through your website, newsletters, fliers, posters and direct sales! Another fundraising option is to sell Flower seeds and Bulbs during the right seasons of the year. These seeds and bulbs are usually big sellers! And yes, a Flower Bulb fundraiser can be really rewarding and profitable. Check it out! Remember that people are often more willing to buy from a charity than from a normal shop. Especially when it is something they want or need! So use that, "Please help our charity out by buying flowers, because we are a worthwhile and needy cause," message whenever you run flower fundraisers! Another consideration would be to add some other fit-able fundraisers when holding your flower fundraiser. Like Candy Bars would go really well with flowers as a gift on Mother's day. Grab this FREE info kit to see what options you have. Be creative and brainstorm the best fits, make your fundraiser as rewarding as possible! Another option would be your organization Apparel from your SSA Apparel Store. Flower fundraisers are easy and profitable... So get your campaign on the go!